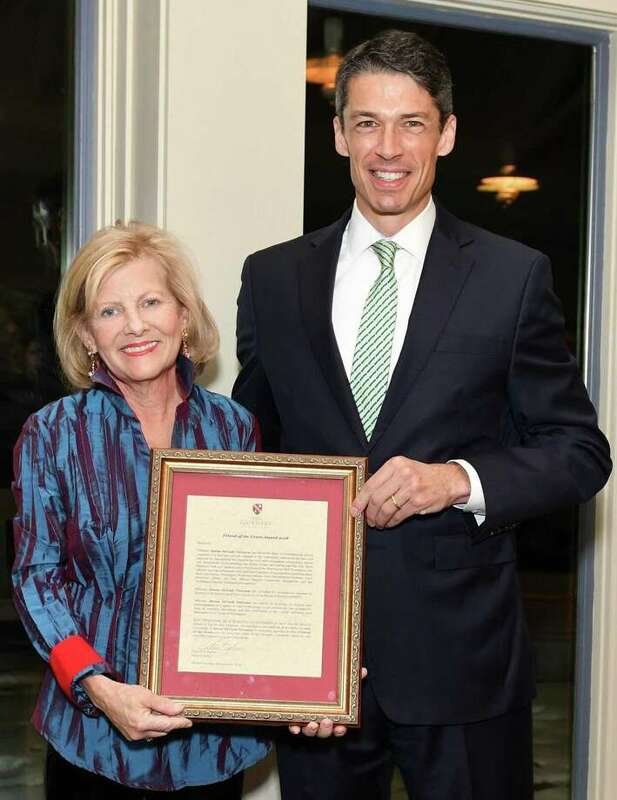 The Gunnery in Washington recently presented its 2018 Friend of the Green Award to Denise DeVault Trevenen. Head of School Peter Becker presents the award to Trevenen during a recent ceremony. The Gunnery in Washington recently celebrated the start of the holiday season by opening its campus to the community for its annual town party. The Nov. 17 event featured the presentation of the 2018 Friend of the Green Award, presented annually by the private school to honor an individual or group that has contributed to the well-being of the town of Washington through their volunteer efforts. This year, the school honored local attorney and community leader Denise DeVault Trevenen of Washington. Head of School Peter Becker, who welcomed the nearly 275 guests in attendance, once served with Trevenen on the board of Washington Montessori School. He described her as an “extraordinary person” and an “unsung hero” in the community, who has dedicated her time and expertise to helping many local organizations and individuals in need. “Friend is a title many people can claim when it comes to Denise,” said Pat Werner, who retired as Washington Montessori’s Head of School on July 1, after 43 with the school. She recalled that when Trevenen was planning to step down from the Washington Montessori board in 2008, she asked Werner to let her know if there was anything she could ever do for the school. Werner said the last thing Trevenen probably expected was to be asked to serve as chairman of the board, and Trevenen nodded and smiled in agreement. Trevenen held that post from 2009 to 2012 and remains an active member of the board today, although her children have long since graduated from the school. A longtime Washington resident and principal at Trevenen & Coploff in Washington Depot, Trevenen has been actively engaged in the community, dedicating her time and expertise to organizations that support the town and surrounding communities. In addition to serving on the boards of the Washington Montessori School and as president of The Washington Park Foundation, she is counsel to the Warren Land Trust and has been a board member of Steep Rock Association since 2014. She also served as a member of the Board of Trustees of Gunn Memorial Library & Museum from 2001 to 2007, and was a board member of the New Milford Hospital Community Foundation and the Washington Citizens’ Scholarship Foundation, now the Washington Scholarship Fund.